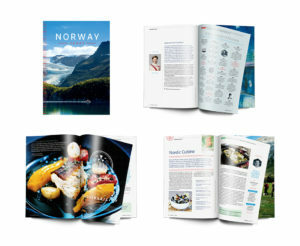 The embassy sought to create an annual publication featuring Norwegian art, culture, oil and gas production, sustainability, and Nordic cuisine while representing a modern Norway. WCM’s editors and designers created Norway Today, a striking, 48-page magazine—with integrated digital elements—that exceeded the client’s expectations. The publication featured innovative design such as custom illustrations and iconic Norwegian knitting-pattern imagery. Norway Today was produced as a print, digital, and mobile magazine with streaming video, photo galleries, and social-media components. Seasonal covers were designed to give the magazine year-round relevance. The editorial content was produced for a Western audience and laid out to create natural transitions between topics.